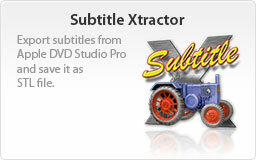 Actually, it’s not a good idea to put subtitles into DVD Studio Pro* directly. A workflow with external subtitle files becomes substantially more flexible, e.g. in the STL format. Subtitle Xtractor detects nearly all STL commands: $FontName, $ColorIndex1, $ColorIndex2 $ColorIndex3, $ColorIndex4, $TextContrast, $Outline1Contrast, $Outline2Contrast, $BackgroundContrast, $HorzAlign, $VertAlign, $XOffset, $YOffset, $ForceDisplay, $FadeIn, $FadeOut, $TapeOffset. If a subtitle clip contains a graphic, then it is detected by Subtitle Xtractor. The absolute path of the grahic is written into the STL file. The fontsize is not clearly detected. Normaly the size of the first character in the first subtitle clip will be taken. If a subtitle clip uses different font sizes, then these formatting information will be lost. * DVD Studio Pro is a registered trademark of Apple Inc. All rights reserved. Alex Asp on 28 Feb, 2008 at 8:08 PM (…) Subtitle Xtractor and Subtitle TC Converter. Great, easy to use tools, most menus are in German, but this is a very small price to pay for tools that will do exactly what you need, IMHO. (…) Subtitle extraction is a much requested tool, as you have no doubt found out. There have been a few shareware offerings over the years, but each has slowly slipped away. Let’s hope yours doesn’t! via E-Mail (…) I want to tell you thank you again. The files worked exactly correct. We have now got the project out the door. Your a life saver. If I ever can do anything for you, let me know. Thank you for creating SubTitle Extractor. What a great program! Is there a way to donate for the work?